If you want to soak up all the dramatic impact your favorite music can deliver then it’s time to look for the best noise-cancelling earbuds. Top-notch noise-cancelling earbuds not only deliver vivid and crystal-clear sound but also guarantee a complete immersion in the world of music not distorted by traffic noises or dogs barking. In order to succeed in the purchase of noise-cancelling earbuds it’s always important to follow certain steps. These are rules which tell you what to check and pay attention to before you make your final choice. The first thing you should be aware of before choosing any kind of earbuds is the difference between noise-cancelling and noise isolation. Very often when we hear noise “something” we think it’s all about the same thing. But it’s not. Noise isolation tries to reduce the amount of external sounds around you physically. The build and structure of such earbuds are aimed to fit your ears perfectly well in order to block extra noise that tries to get into your ears. They form a good seal around your ear canal and all you can hear is just your favorite song. Noise isolation is also known as passive noise cancellation. Noise-cancelling earbuds involve a special DSP (digital signal processing) technology which cancels out the sound waves coming from the external noise. It presupposes the use of internal mic and audio processor which receives sound around you and produces an opposite one that cancels it out. Such interference has become the basis of noise-cancelling, which is also called active noise cancellation (ANC). You can learn more about the key principles of its work here. Note that noise-cancelling earbuds as well as noise-cancelling headphones won’t allow you get disturbed by a jet engine or neighbors’ jabber. However, they aren’t adjusted very well to such acute sounds as a child’s squeal or a vase breaking to pieces. Remember that noise-cancelling, as well as noise-isolating earbuds, aren’t safe to wear when you need to be attentive, e.g. when crossing the road. But an aircraft cabin is a nice chance to test both of them. One of the most important things you should do before purchasing earbuds is to try them on. They should fit you perfectly well. Just remember that spending an hour with your new earbuds should feel like bliss but not a torture. Another thing to pay attention to is cables. If you don’t want the earbuds to be tangled up every time you take them out of your pocket it’s better to look for wireless ones. They are more comfortable in use especially if you like wearing them when working out or tidying up your house. The best way to check build quality of noise-cancelling earbuds is to try them on. There’s no need to turn music on. Just try to listen to the external sounds around you when wearing the earbuds on. You can also ask your friend to talk to you at different distances and voice pitch. Noise-cancelling earbuds with high-grade audio processor and drives will cancel out such sounds easily. Another thing you should do to choose the best ANC earbuds is to listen to music. Connect them to your device (at the same time you’ll have a chance to test their compatibility) and listen to your favorite track. This will help you to check not only sound quality but noise cancellation level too. What we really like about ANC earbuds is that you don’t need to turn them to the highest volume in order to drown out the sound of the jet engine. This improves the sound quality on the whole and prevents you from getting deaf. 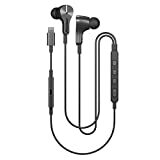 When choosing noise-cancelling earbuds, you will notice that a lot of them are wireless and get connected via NFC or Bluetooth. Of course, the best option is to choose earbuds which support both types of connections. Still, if you have to choose between them then Bluetooth is definitely the best one to have. The point is that not all of the devices have NFC as Bluetooth connection is more popular. What is more, Bluetooth connection is faster than NFC and can process larger files. One more feature to take into account when choosing earbuds is battery life. Wireless earbuds are great and comfortable in use but only when their battery life is long-lasting. Battery life can vary from 10 to 30 hours. So, if you spend lots of time listening to music and podcasts being far away from the place where you can charge your earbuds then the choice is obvious – you need something really powerful. Keep in mind that some models support both wired and wireless types of connection. Aren’t noise-cancelling earbuds harmful? This question bothers a lot of people who take care of their health. In fact, when build quality of the item is fine it can be even good for your health. If you spend much time in noisy surrounding among loud traffic then ANC earbuds can become your lifeline. 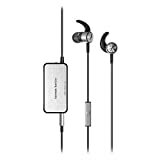 What is more, having noise-cancelling earbuds you can listen to music at moderate volume as there is no need to turn it to maximum in order to enjoy your favorite song to the full. To learn more about healthy hearing follow this link. Don’t expect cheap earbuds to deliver top-notch cancellation. 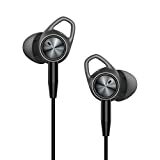 Active noise-cancelling earbuds include a processor, which is responsible for the destructive interference, and its quality depends directly upon the price of the unit. Add to this list build quality and internal drives, which are also dependent on the sum of money you are ready to spend on the earbuds. In a word, if you want something really powerful and reliable then get ready to pay for it. Budget items may be also fine but they won’t impress you with their performance. Still, remember that even the priciest earbuds aren’t able to block every extra sound around you. These are one of the best earbuds offered by today’s market. They come with Active EQ and TriPort technology for immersive and accurate sound. Bose Quiet Comfort 20 provides a comfortable fit thanks to its StayHere+ tips. It has also got Aware mode to keep you safe when crossing a busy street – just switch it on and you will hear what is happening around you. 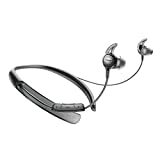 Bose Quiet Comfort 20 is compatible with all iOS and Samsung Android devices. These noise-cancelling earbuds also provide convenient control and long hours of use due to a built-in rechargeable battery. With 15 hours working time and a perfect fit in your ears (due to different sized ear tips and fins), the TaoTronics earbuds are perfect for any type of situation. You can use them to forget about the world around due to the Active Noise Cancelling feature that reduces environmental noise by up to 25dB. Still, for those cases when you want to be aware of your surroundings with ANC still on, the earbuds have Monitoring Mode. This one allows you to hear announcements or what’s around. The earbuds work just as well for phone calls (or audio/video conferences) due to the built-in MEMS microphone that allows your voice to be crispy and clear. Moreover, you also get in-line controls, so there’s no need to reach out for your phone anytime soon. Finally, the earbuds feature a solid aluminum alloy housing with a black matte finish that gives them an elegant look. They’re also delivered with an airline adapter and travel pouch for easy handling. These lightweight earbuds are made of durable and scratch-resistant metal. Thanks to memory foam ear tips B&O Beoplay E4 earbuds are comfortable to wear for a long period of time. By the by, there are included four different silicone ear tips in order to provide a perfect fit. B&O Beoplay E4 comes with the advanced hybrid ANC which allows saving Bang & Olsen Signature Sound quality. Note that these noise-cancelling earbuds are wired and have a built-in battery with up to 20 hours or ANC playtime. If you like to control everything then Bose Quiet Control 30 was made namely for you. These earbuds come with a special technology that allows you to control noise cancellation all the time. Besides, it is highly compatible as it supports Bluetooth and NFC pairing. They will be also a great choice for making calls. Bose Quiet Control 30 has a noise-rejecting dual-microphone system, so you will be able to hear your friend’s voice perfectly well even in windy weather. Need really smart earbuds? 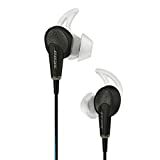 Pioneer Rayz Plus are one of the first in-ear headphones that can automatically recognize “Hey Siri” commands for making calls. You can also use it to send a message or change a track on your playlist. In addition to this, there is Smart Mute mode which mutes a mic when you aren’t speaking and unmutes it when you decide to start a talk. These noise-cancelling earbuds are very adaptable and can be used while charging. The wireless design, the 12mm driver, and the high-end ANC features put the Phiaton BT 120 NC earbuds close to the top on many people’s list! Moreover, they are lightweight and fit perfectly in the ear due to the Double Injection ear tips. Once they are set and the ANC is on, you’ll step into a world where you and your tunes have privacy regardless of the fact that you’re at the gym or in a crowded park. The ANC is so efficient that it cuts down up to 95% of the regular noises that ensue in an office or gym. 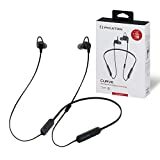 Speaking of gyms and working out, the earbuds have an IPX4 splash resistance certified rating and are sweatproof, so you can wear them during your most demanding activities. Moreover, the battery will last for about 8.5 hours and supports fast charge functionality, so you have plenty of time to enjoy music and high-quality phone calls. Finally, they feature smart vibration notification where light vibrations let you know of an incoming call or if you step out of range. The neckband is lightweight and feels nice against the skin, while the in-line controls provide easy access to various actions. As well as Phiaton BT 220 NC these noise-cancelling earbuds come with ergonomic design. They are lightweight and great for a business trip or family voyage. Soho II includes one-button microphone/remote which allows you to control noise environment around you. Still, their sound quality greatly depends on noise cancellation. If you switch it off, you will see a considerable difference. 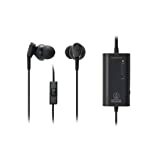 Audio Technica is known for the impressive quality of their products in both build and sound. So, it’s only natural that the ATH-AN33IS QuietPoint earbuds would pack the same features. Equipped with 53 mm drivers, the earbuds reproduce clear treble and midrange, which means most audiophiles will love them. Moreover, the ear tips are designed to fit comfortably in the ear and maintain the same level of comfort during long-time use. The stellar sound is supported by the ANC feature which manages to reduce up to 90% of the background noise. Also, the OFC single-sided cord is highly-conductive and the elastic TPE sheath prevents tangles. The wire is fitted with the QuietPoint control which you can use to turn ANC on and off and an in-line remote that can be used to answer calls and skip tracks. The battery will hold for up to 60 hours, but even without it, you can still use the audio features of these earbuds. Do you want something really special? Shure SE535-V+BT1 are one of the most exclusive noise-isolating (yes, not really noise cancelling) earbuds for those who know how top-notch audio must sound. You will see that it’s the best noise-isolating earbuds on our list at first sight. They have a very stylish look that is also combined with a comfortable fit. Shure SE535-V+BT1 are equipped with triple high-definition drivers that deliver immersive and accurate sound. Its Bluetooth 4.1 version allows pairing with all updated devices. Besides, these earbuds come with inline remote and 8-hour battery life. There are plenty of noise-cancelling earbuds to choose from. In order to choose the best of the lot don’t forget to check the tips mentioned above and our list of best noise-cancelling earbuds on today’s market.